Suggestion to have an "Actions in Real Time" widget... I think you already show this data in the real time visitors module but I have to hover over a lot of the recent pages viewed to try to determine what people are looking at. This is a proposal to do something like ChartBeat where you organize that info to display what content is popular NOW. I will try to attache a screen shot to this ticket. This could be very similar to the "Visitors in Real Time" but instead of grouping pages for each visitor on one line, you would do the opposite... each line would be for a page of content (by title) and you would list little icons representing visitors underneath the page title. The widget would be ranked by whatever pages have the most recent actions, perhaps in the last 15 minutes or so (or make this a configured option by the user). I also think it would be best to only represent a unique user a SINGLE time within the entire module... that user would appear on the content they most recently viewed. That way, if a user goes randomly clicking a dozen pages on the site without really looking at them, it doesn't skew the numbers too much. The main idea is to show what pages on a site where users are at the moment, and they can't be paying attention to more than one page (for the most part). You might also check out how ChartBeat works, as this is a proposal for similar functionality to the major focus of their product. In my opinion, this is the biggest thing missing from Piwik for people like myself wanting to switch from ChartBeat. Piwik is SO much more robust than ChartBeat in other areas, but it is hugely helpful to see how content is performing on the site grouped by activity on each piece of content in real time. I monitor chartbeat very closely and within 2 or 3 minutes of putting up a new post on my blog I can tell if it is a winner or loser. I can also immediately see if I suddenly am getting a BIG link driving a lot of traffic to a post. If anyone has suggestions or ideas, feel free to leave a comment - What do you most need from Piwik in real time? Hi Matt, unfortunately I'm not in a position to sponsor a feature at the moment. But while I'm here, let me just add a little more info about how ChartBeat does this in case someone decides to look at this in the future. My proposal above is for something more simplified than what they do, and something that I think would be easier to implement with the existing framework of Piwik. 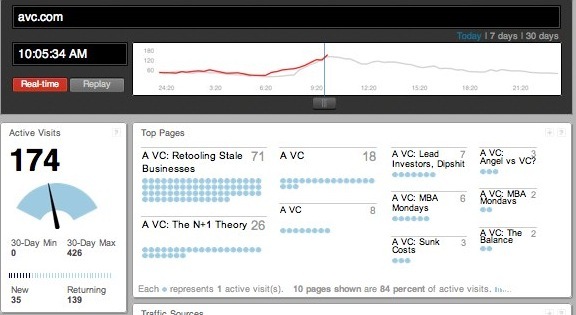 ChartBeat, on the other hand, attempts to measure user activity on the page and how long people stay on it. They breakout reading, writing and idle activity types. So I suppose they are keeping the user included in the statistics as long as the browser window is open.... and I'd also assume that a user could be counted as on multiple pages at once. If you ask me, I think this is overly complex and probably imprecise anyway. It can also lead to some incorrect assumptions about "current" activity on a website if a lot of the content that appears active is really only windows that were left open. That's why my original post in this ticket proposes that a single user is only counted under a single page at any one time, and that the users just time out after a set period unless it would be easy to determine exactly when they've left a page (and the site for the current visit). If the administrator can see who is visiting the website and who left the website, it would be perfect.